The 6oz black leather flask is built strong with a tethered cap and a unique wide-mouth pour for easy sipping and pouring. The flask also has an oval engraving plate perfect for a name, initials or message to make it a personalized gift for that someone special. Our flasks come 6oz. Great shapes and unique styles bring new life to a proven winner for gift-giving. 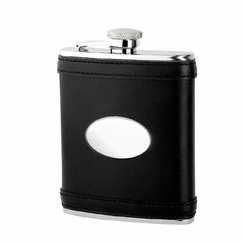 With a curved back these engraved flasks are comfortable in the hand and pocket. All personalized flasks are made of stainless steel so they have a solid feel that will never tarnish. Engrave any flask with a name, initials, Greek letters for a fraternity or sorority, or a message.